Monster Magnet frontman Dave Wyndorf has started his own record label. Studio 13 will release 7”s and accompanying download cards focussing on Monster Magnet related music, although Dave said eventually the label would look at signing bands. more info! 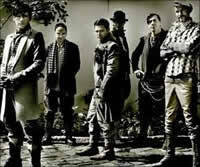 Rammstein first stormed America in 1998, touring with a set based on their Grammy-nominated breakthrough second release, Sehnsucht, featuring “Du hast,” the song that brought the world’s attention to the band. During their 1998 Family Values tour, praise was high, as well as indignation: band members were jailed in the US on indecency charges due to the highly provocative live show. more info!